Eggplant is a strange vegetable (actually, it's a fruit). It's related to tomatoes—which are part of the (deadly) nightshade family. Each eggplant contains the nicotine of about 1/30th of a cigarette. Eggplants are native to India, and seem to have made their way to western Europe sometime in the 1500's, along with tomatoes and the Renaissance. Eggplants seem unnaturally lightweight for their size—which is part of what makes them such a versatile main ingredient. Unlike outwardly similar vegetables like cucumbers, squashes, and zucchinis, eggplants are not saturated with water. This airiness allows eggplants to soak up lots of oil during cooking, which is part of why they seem so meaty and rich. This is a one-skillet recipe, and takes about 1 hour and 10 minutes start to finish. I use gluten free bread to make my breadcrumbs, but you can use regular bread/crumbs if you don't mind the wheat. I don't peel the eggplants since I enjoy the skin, but you can peel them if you prefer. I'd recommend not using extra virgin olive oil since it can burn and add bitterness. Stick with regular olive oil (or even canola in a pinch). Slice the eggplant into 1-inch thick slices. Sprinkle each slice with kosher salt on both sides (just a light sprinkle, less than 1/8 teaspoon per slice). Let the eggplant slices sit for 30 minutes. This helps draw out some of the bitter flavors from the eggplant, and removes further water. You can make the marinara sauce while you're waiting. You can also toast the bread in preparation for making your breadcrumbs. Once you've toasted the bread, let it cool to room temperature. Cooling the bread to room temperature after toasting is an important step, as it allows more moisture to escape from the bread (leaving you with crumbs rather than mush after a trip through the food processor). Once cool, pulverize the toasted bread slices in a food processor. Once the bread has reached a fairly crumby texture, add 1/2 cup of the parmesan cheese and give it a few more pulses until they are proper crumbs. Dump the breadcrumbs and parmesan into a mixing bowl, and add a pinch of dried oregano and the flour. Then add salt, pepper, onion powder, and granulated garlic to taste. And I really do mean "to taste." Taste the breading and re-season as necessary. The breading should taste good—not unlike how a well-flavored Italian herb and parmesan cracker might taste if you ate the crumbs. When in doubt, add more salt. To make the dipping wash, beat one egg, and add to it 1/4 cup whole milk. Mix well. Pre-heat your oven on 325 degrees F.
Heat a large cast iron skillet on medium heat, and wait 4-5 minutes for it to come up to heat. When it's just starting to send up wisps of smoke, add a solid coating of olive oil, and begin breading the eggplant. To bread the eggplant, pat the slices dry with a paper towel to soak up the water that was drawn out by the salt. Then dip eggplant slices in the egg wash—being sure to get full coverage. Bread the slices thoroughly on all sides. Don't be afraid to use your fingers to get as much breading on each slice as possible. Cook the eggplant slices until nicely browned, and then flip them over and brown the other side. This might take 3-4 minutes per side. Once the eggplant slices are browned on each side, put a generous dollop of Outstanding Marinara Sauce on top of each slice. 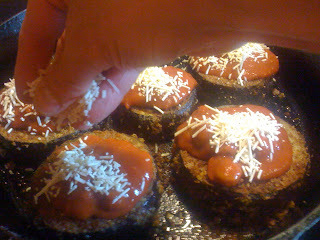 Sprinkle each slice of eggplant with a respectable pile of parmesan cheese. Place the skillet in the oven, and bake on 325 degrees F for 25-30 minutes. Remove your eggplant parmesan from the oven to let cool for a few minutes, and serve! I like to serve this dish right in the skillet for a nice presentation. Be sure to warn your guests of how hot the pan is. This dish goes well with rice pilaf and caesar salad. This sounds really good. How creative you are! Well thanks! Let me know if anything is unclear or amiss you decide to give it a whack. Thanks! Superb write-up on the egg plant. While not highly used during the trail drives of the early day cattlemen, the egg plant is a unique dish that will impress even the utmost critic when prepared and cooked correctly. Enjoyed your notes on this excellent dish. Hope to see you do this again perhaps as a vegan BBQ dish. Thanks for stopping by. I don't suppose eggplant saw a lot of trail time with the settlers--but it probably should have! Vegan BBQ... now that's a challenge worth taking up. I'll see what I can do. Thanks! I've been craving this but hadn't looked up a GF alternative! Thanks for providing one. Can't wait to give it a try (wink)! Thanks for your kind words. Please let me know if you have any questions once you try it! Looks great, but if you're going gluten-free, the rice pilaf is a no-no; the "pilaf" is orzo, a wheat based pasta. But I really like the recipe otherwise. Technically, a rice pilaf is just rice cooked in a broth. But I have had folks ask about orzo--which easily masquerades as rice... so thanks for pointing out that potential hazard for those that are gluten free. Rice pilaf is no problem, but an orzo pilaf would be trouble.